Editor’s Note: This piece is part of the Back-to-School series on the Tableau blog. At Tableau, we feel that data skills are essential for the next generation of workers and business leaders. Tableau’s Academic Program seeks to arm students with the valuable analytical skills needed to make data-driven decisions, both academically and professionally. Recruiters spend just 6 seconds reading each job application, so it’s important to make your resume stand out from the crowd. And in a world where data literacy is one of the most in-demand skills in the workplace, your resume should reflect your ability to convey information in a clear, useful way. 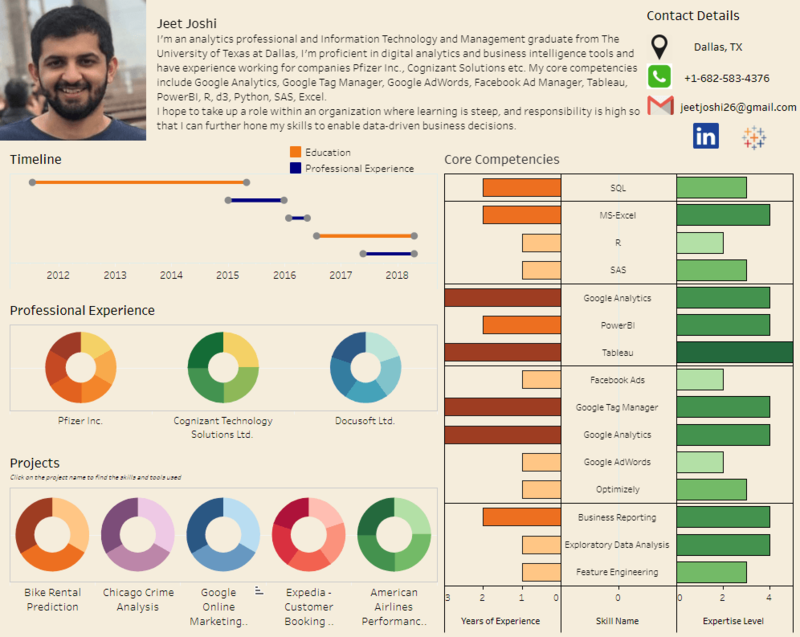 As a recent graduate in a data-focused role, I’ve found that an interactive resume is much more impressive to a prospective employer than the standard PDF or Word document. Why tell recruiters you’re a Tableau whiz, when you can show them? Use a Gantt chart to make your timeline easy to understand. Unlike lists, Gantt charts call attention to the most important items on your timeline. 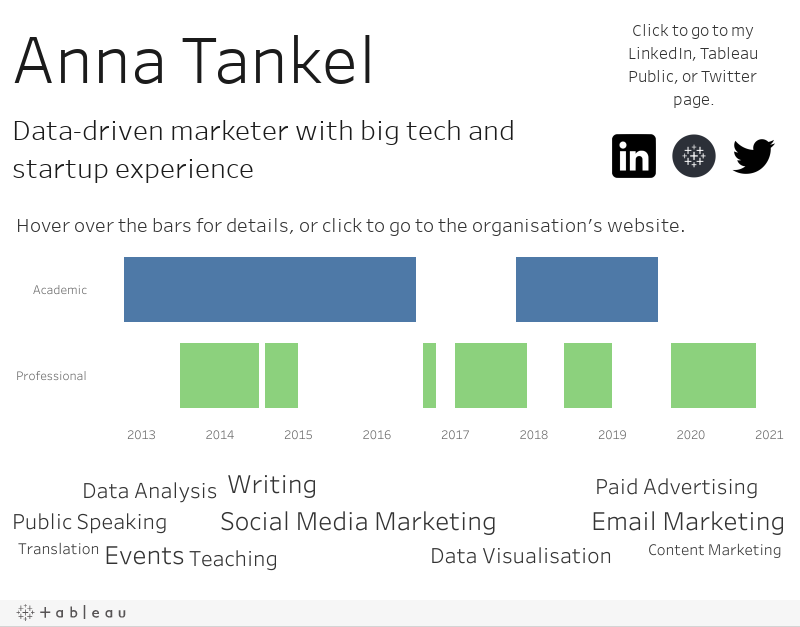 The viewer can see the shape of your career at first sight, and then hover over each bar to read the details. With an interactive resume, you no longer have to choose between clean design and detail. You can keep the design simple, and use tooltips to let the viewer dive into the details as they wish. You’ll almost certainly want to link to your LinkedIn profile. And depending on your use of social media and the type of jobs you’re applying for, you may want to link to your Twitter profile as well. This is a great way to give the viewer a sense of your personality. But don’t just stop there! In cases where you want to include multimedia—to feature your portfolio assets, for example—you can add YouTube videos, Wikipedia pages, and even music to your resume. Let’s be honest, you really need an interactive resume to show off your data presentation skills. Your resume is a unique chance to show your creativity and ingenuity, so think carefully about how you want to present yourself to recruiters. 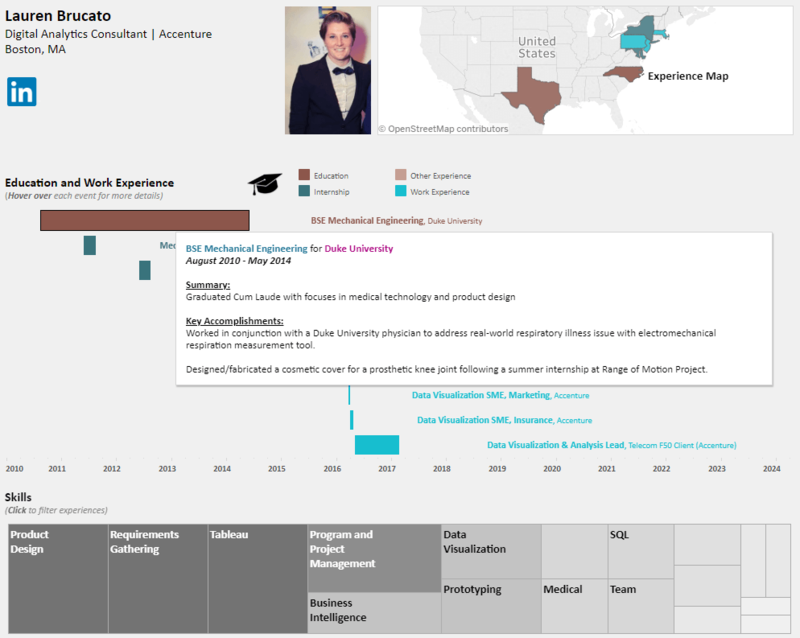 Check out this viz gallery for more examples of Tableau resumes. Ready to get started? Download your free Tableau for Students license today.